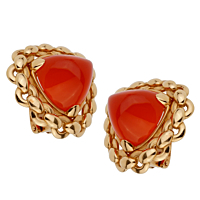 Circa 1980's stunning vintage sugarloaf carnelian gold earrings from Hermes. 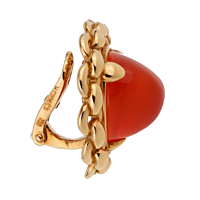 The prong set earrings showcase two trillion shaped, deep orange carnelian cabochon gemstones edged in 18k yellow gold. For added style and embellishment, the carnelians are surrounded by tiny gold link chain motif, and the clip on elements are stamped with the Hermes logo.